Home » Beauty • Face • Know How » Is Mattitude HD Make Up good? This morning I woke up in a great mood and a few seconds later, I realized that it was raining again. The weather was not matching my inner state at all. I’ve decided that I will share with you my thoughts about the product towards which I have equally mixed feelings. A few ago I bought the ‘Mattitude HD Make Up’. I had seen adverts everywhere and when I finally bumped into the Astor counter in my local drugstore I decided to give it a go. The specific aim of this product is to give you flawless skin that will show nicely on photos without your face ‘flashing back’. The foundation has a thick, creamy consistency that dries on skin pretty quickly. You need to have a fitted hand to distribute it evenly before it will create dry patched on your skin. It is a long-lasting and mattifing product so using a deep moisturiser beforehand is a must. The foundation comes in a nice bottle with a pump. I normally don’t have a problem with getting the right amount out but not in this case. Due to its consistency, I couldn’t predict how much I will need. 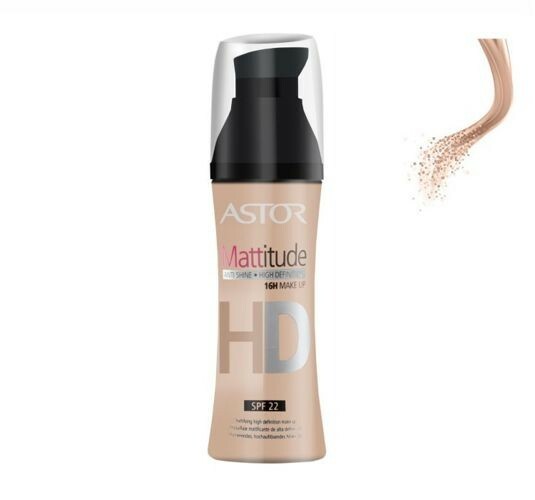 If you manage to apply it evenly, the ‘Mattitude HD Make Up’ will give you medium coverage with a natural looking, matte finish. Those of you who have a dry skin may be disappointed to know that the product has flaked off a bit from my cheek areas. It may be great for combination or oily skin but I wouldn’t recommend it for dry skin type. As I have a few spots on my forehead, I found it difficult to cover them with one layer. The second layer however gave me an impression of cakyness. I was pretty disappointed with the lasting power of this foundation. After about five hrs, I noticed that the make-up was wearing down and my T-zone became tacky. I had to touch it up with my matte powder. I took some pictures right after applying the foundation and I must admit that my face looked amazing. My pores were invisible and my fine lines were not defined. I was surprised that I may look so good on photos. To conclude, I think this is a good product on the condition that you have a combination or oily skin type and that you set it with the powder. Great if you are planning to have some photos taken. I would love to hear your opinions about it. Have you got similar experience?